Microservices and new 3rd-generation API Management capabilities are very natural technical partners. A (micro)service provides the execution logic for a single capability and 3rd generation API Management provides the means to control the exposure of each service to the outside world, and potentially between the (micro)services as well. Luis Weir’s article, 3rd-Generation API Management, explains the evolution of the API Management capability, and what the 3rd generation offers that makes API Management mesh well with (micro)services. 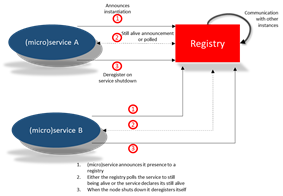 For this article, though, we are going to explore the role of registries in a (micro)services environment and ultimately their relationship to API Management. We aren’t going to dive deeply into any specific solution, although we will reference some of the better known options, and provide links to where you can dig in further. You’ll note I have referred to microservices as (micro)services. This is very deliberate, and possibly contentious.Microservices are typically associated with certain technologies such as Docker and lightweight app containers such as Tomcat, but from my view point if you’re going to be a purist about microservices, then (as with SOA) you need to think about the design paradigm and the principles—NOT the technologies. It is with this view point we often have to work as, unless you’re fortunate to be working in a services organization that is very enlightened or just plain fortunate, the decisions and constraints you have to work with will mean you need to make some pragmatic decisions. An organization that has made heavy investment in WebLogic licensing isn’t likely to be comfortable in giving it up—but this doesn’t mean you can’t adopt a microservices approach, although certainly you need to mitigate risks that using WebLogic can create when adopting the architecture. Secondly, the concept of registries isn’t unique to microservices; in fact, some of these solutions have origins in solutions such as Big Data/Hadoop offerings, for example. To underline my point, Gartner has started to talk about mini- or micro-apps as a flavor of microservices. The essence of this is the application of microservice principles but in a more pragmatic manner—not every organization needs hyperscaling and super elasticity like the poster children of microservices (e.g., Netflix and Uber). But we all do need the means to easily manage the addressing of services. To understand the role of a registry, we need to step back and understand some of the ideas underpinning microservices. So let’s just recap: Read the complete article here.